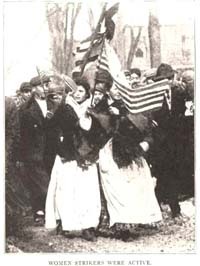 Women and Social Movements in the United States, 1830-1930. http://womhist.binghamton.edu/. Kathryn Kish Sklar and Thomas Dublin, eds. Binghamton University, State University of New York, 1998, 1999 (revised and updated). With Women and Social Movements in the United States, 1830-1930, Kathryn Kish Sklar and Thomas Dublin continue to demonstrate their commitment to the improvement of teaching history. Already co-editors of a two-volume collection of articles about women in the United States, the two scholars have now teamed up to build a Web site that features documents illustrating the history of American women's involvement in social movements between 1830 and 1930. Funded by the National Endowment for the Humanities, the site is intended for classroom use, and is itself the expression of classroom practice as it publishes research projects completed by undergraduate and graduate students at the State University of New York at Binghamton, where Sklar and Dublin teach. Each project is edited by Sklar and Dublin, which guarantees consistency in form and clarity in writing. It is a masterfully organized site that will serve students in high school through graduate school. It will be useful in a broad spectrum of courses, ranging from the U.S. history survey through women's history courses and courses that focus on the Gilded Age/Progressive Era to courses that seek to teach students how to construct a historical essay. Movements in the U.S. Web site. Because new materials are being added periodically, I should begin by saying that I viewed the site most extensively on May 7, 1999. At that point, 15 projects appeared on the site, and the overwhelming majority of them focused on the period between 1880 and 1930. Each project begins with a very clear and succinct statement of the student's research question. A project on the Lawrence Strike of 1912, for instance, asks, "How did immigrant workers struggle to achieve an American standard of living?" Another queries, "How did African American women define their citizenship at the Chicago World's Fair in 1893?" On the page that first states the question, each student elaborates her question as well as her strategy for answering it. For instance, one author, seeking to learn how middle-class clubwomen contributed to infant and maternal health among immigrants, explains that she has mined the archive of New York City's Women's City Club to find an answer. The projects focus on a variety of organizations and issues in the history of women's activism. In time, they range from the Freedmen's Aid Movement in the 1860s to the Women's International League for Peace and Freedom in the 1920s. They treat both local politics (in projects that study, for instance, Minnesota's Women's Christian Temperance Union and the work of local branches of the American Association of University Women) and international relations (in a project that illuminates the women's peace mission to Europe in 1915). And, they ask questions about race as well as class relations (in addition to projects already mentioned, these include those on black men and woman suffrage, on the National Woman's Party and the enfranchisement of black women, on workers and allies in the New York City Shirtwaist Strike, 1909-10). 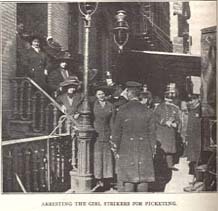 "Arresting the Girl Strikers for Picketing." From the first page of a project, viewers can go to either the introduction or document list for the project. Although the introductions vary in length, they generally function as historical essays that lay out the issues involved in answering the original question and discuss the significance of the documents. Each introduction is fully documented with endnotes that serve as rich bibliographies on each question. Endnotes may be read one at a time as a reader goes through the introduction or may be accessed separately and in full. With only a couple of exceptions, projects then feature 15 to 20 documents that help to answer the research question. Each document has a headnote, and the documents range from brief editorials and letters to Ida B. Wells's 81-page pamphlet, The Reason Why the Colored American is Not in the Columbian Exhibition. Indeed, one of the great advantages of a Web site over a book of documents is that very long documents do not need to be shortened. The Web allows publication of the entire piece. Another terrific advantage of this Web site over any book of documents is that it allows users to do keyword searches of all the projects simultaneously. So, for example, one can search for "suffrage" or "race" throughout the Web site and come up with all the introductions, endnotes, and documents that mention the selected keyword. Most projects also include a bibliography and list of related links. Some users might register complaints about the site. For instance, only a small minority of projects provide any other than written documents, which might seem not to take full advantage of the Web's possibilities. But, this makes for quick loading of every page on the site, and the related links do take researchers to sites that feature images and more complicated uses of the Web, like a virtual exhibit at the National Museum of American History that studies American sweatshops since 1820. At present, the projects study only black and white women, a focus that has resulted from the reliance of students on microfilmed document collections to do their research. Sklar and Dublin themselves have publicly asked for help in locating microfilmed document collections illustrating the involvement of Latinas and Asian American women in social movements, and they can be reached through the Web site. The value of the site greatly outweighs any limitations. In fact, my first impulse on exploring the site was to assign it in every class I teach because each project so clearly exposes the steps in creating a good historical essay. I will certainly use it in both graduate and undergraduate research seminars next year for precisely that purpose even though neither seminar will focus on women in social movements before 1930. In other sorts of courses, professors might assign a particular project as reading for discussion; might select documents from a number of projects as the focus of a writing assignment; or might use the projects as models for research by her own students. To show students that any historical document speaks to multiple issues, teachers might have students read a particular project and then define additional questions that the same documents illuminate. Similarly, students who have access to the secondary sources cited in each introduction might be asked to devise their own strategies for exploring the question posed by a particular project. I am sure that creative teachers will see other uses for the site as well. These are just a few of the possibilities for this rich resource.